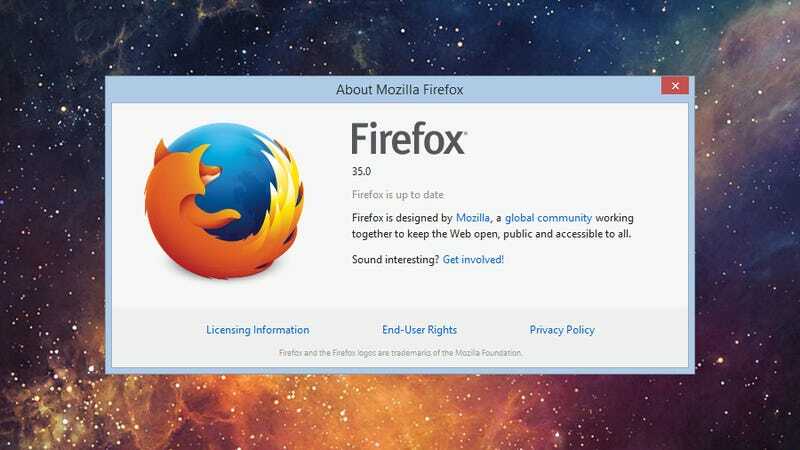 Firefox 35 is out with improvements large and small. If you've never tried out Mozilla's alternative web browser, or you're tempted to come back to it after a break, here are 10 software tips that will make your experience with Firefox all the more productive and rewarding. You can download the latest version of the application from the official site. Firefox's video chatting capability is the most significant new feature for version 35 of the software—it offers a Skype-style experience with no additional apps or plug-ins required. You don't even need to sign up for an account of any kind if you don't want to. All that's required is a shared link. That link will work in any browser, though Firefox-to-Firefox gives you the best and most stable performance. To get started, simply click on the Hello smiley face button (if it's not showing, open the Firefox menu and choose Customize). Then, select Start a conversation and you'll be prompted to invite someone into the chat. Use the supplied URL over email or a message board to get other people involved. From the pop-out Hello window you can manage your chats, set your status, and access other features for the add-on; if you set up and sign in with a Firefox Account, you can organize and launch calls more easily. Firefox has recently revamped the search experience inside its browser. As well as changing the default provider as normal, you can quickly switch between different search engines depending on what it is you're looking for. It's perfect for when you want to check Wikipedia or Twitter exclusively, for example. Start typing in the search box in the top right-hand corner and you'll see these one-click search alternatives appear beneath the list of suggestions: eBay, Amazon, Wikipedia, DuckDuckGo and Twitter are all included by default. Click Change Search Settings to add or remove search engines (YouTube, Google Translate and IMDB are some of the other options available). Adding keywords to your bookmarks makes them easier to access in Firefox. You won't have to have the bookmarks bar on show, because you can simply start typing out a relevant keyword in the address bar (or Awesome Bar) to see a link to a chosen site appear. If you have a lot of different sites to switch between and you prefer keyboard shortcuts to pointing and clicking, it can make a big difference. If you prefer, you can assign keywords of one or two characters to your bookmarks. These sites are then going to appear first once you enter the relevant letter in the address bar. Right-click on a bookmark link anywhere in Firefox (in the Bookmarks Sidebar for example), choose Properties, and then enter your chosen keywords. Firefox also lets you supply tags for each of your favorites to make them easier to sort. By default, Firefox makes you wait five seconds before installing a new extension to make sure you know exactly what you're doing. If you're a power user happy to take the risk, you can switch this delay off via the about:config screen (the go-to page for those who want to hack the browser, where you can discover a whole host of hidden settings). Enter about:config in the address bar and then search for the security.dialog_enable_delay string (you may find the search box at the top useful for this). Double-click on it to change the delay or set it to zero if you just want to get right on with installing your add-ons. Remember, you do so at your own risk. Like most modern-day browsers, Firefox can remember passwords and login information for the sites that you visit. However, anyone who sits down at your computer can then take a peek at your saved passwords if they know where to look. To make it harder for other people to see the information that's stored, you can set up a master password to protect all of the others. From the Firefox menu, choose Options and then Security. Click the box marked Use a master password and the program will then prompt you to enter one (and rate how easy it is to crack as you type it out). Make sure it's not something you're going to easily forget, because without it you won't be able to review the passwords saved by Firefox (though they'll still work as normal). Keyboard shortcuts are all a bit 2014; this year, everyone's using mouse shortcuts. If you know the right combinations then you can power through websites and menus and get your browsing done in record time, so we thought we'd share a few of Firefox's mouse shortcuts (these usually work in alternative browsers such as Chrome too). Ctrl+scrollwheel will zoom in or out of the current page, while Shift+scrollwheel acts as a shortcut for the forward and backward navigation buttons. Tapping your mouse scrollwheel on a tab header closes that tab, and tapping the scrollwheel on a link opens it up in a new tab in the background (always helpful for those of us who like to have dozens of tabs open at once). Ctrl+left click is another way of opening a link in a background tab. This is another trick that involves the famous about:config screen. Open up a new tab and Firefox will show you a list of recently visited sites, which is a 4x3 grid by default. If you want to add some more thumbnails to this screen, and get quick access to a longer list of sites, then it's an easy tweak to implement. Open up the about:config page from the Awesome Bar and look for the browser.newtabpage.rows and browser.newtabpage.columns entries in the list. Double-clicking on these entries lets you make changes to the values, changes which are then instantly applied. Sites can be pinned to or dismissed from the New Tab page using the icons overlaid on top of them. Firefox has a more than adequate private browsing mode as well as a clear history function, but there might be times when you just want to remove one particular entry from the list of sites that appears below the Awesome Bar when you start typing. Thankfully, this is easily done in Firefox, so your partner, kids, colleagues or whoever happens to be looking over your shoulder will never know about your embarrassing taste in music (for example). Start typing out the name of the site in the Awesome Bar at the top of Firefox's interface. Use the cursor keys to go down and select it, then tap Delete. In an instant the site in question is banished from Firefox's memory. Note that this doesn't work for web pages that have been bookmarked, as they'll simply appear again next time as normal. Here's a tip for Firefox for Android Beta: You can cast individual tabs to a Chromecast dongle in the latest beta edition of the app. The feature is still new and experimental but it's a helpful way of showing off a web page, a chart, a Twitter update or anything else from the Internet on a big screen. Note that this option isn't yet available in the stable version of Firefox for Android. When you've opened a tab that you want to cast, tap the app menu and choose Tools then Mirror Tab. If your Chromecast is switched on and connected to the local network, the selected tab should show up on whichever big screen you have the dongle attached to. Only the website itself is shown, without any extra interface elements. To stop the casting, open the app's main menu again. You might know that there are a huge number of third-party add-ons and extensions for Firefox, but perhaps you haven't realized that Mozilla is testing a new-look Marketplace portal to hold all of the standalone browser extensions. It's been designed to work across the mobile Firefox OS, Android devices, and Firefox on the desktop, and it makes the process of discovering and installing browser apps very simple. Anything you install from the Firefox Marketplace will add itself as a standalone app on your system. These apps run in their own window (usually full-screen by default) and give you instant access to a growing selection of utilities and tools (SoundCloud, Telegram and Wikipedia are some of the desktop apps currently available). To install traditional extensions, choose Add-ons from the Firefox menu then Get Add-ons.